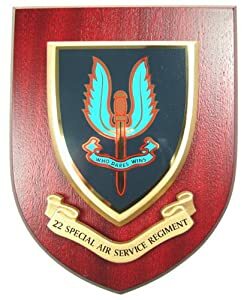 The Special Air Service was a unit of the British Army during the Second World War, formed in July 1941 by David Stirling and originally called “L” Detachment, Special Air Service Brigade—the “L” designation and Air Service name being a tie-in to a British disinformation campaign, trying to deceive the Axis into thinking there was a paratrooper regiment with numerous units operating in the area (the real SAS would ‘prove’ to the Axis that the fake one existed). It was conceived as a commando force to operate behind enemy lines in the North African Campaign and initially consisted of five officers and 60 other ranks. Its first mission, in November 1941, was a parachute drop in support of the Operation Crusader offensive. Due to German resistance and adverse weather conditions, the mission was a disaster: 22 men, a third of the unit, were killed or captured. Its second mission was a success: transported by the Long Range Desert Group, it attacked three airfields in Libya, destroying 60 aircraft without loss. In September 1942 it was renamed 1st SAS, consisting at that time of four British squadrons, one Free French, one Greek, and the Folboat Section. In January 1943, Stirling was captured in Tunisia and Paddy Mayne replaced him as commander. In April 1943, the 1st SAS was reorganised into the Special Raiding Squadron under Mayne’s command and the Special Boat Squadron was placed under the command of George Jellicoe. The Special Raiding Squadron fought in Sicily and Italy along with the 2nd SAS, which had been formed in North Africa in 1943 in part by the renaming of the Small Scale Raiding Force. The Special Boat Squadron fought in the Aegean Islands and Dodecanese until the end of the war. In 1944 the SAS Brigade was formed from the British 1st and 2nd SAS, the French 3rd and 4th SAS and the Belgian 5th SAS. It was tasked with parachute operations behind the German lines in France and carried out operations supporting the Allied advance through Belgium, the Netherlands (Operation Pegasus), and eventually into Germany (Operation Archway). As a result of Hitler’s issuing of the Commando Order 18 October 1942, the members of the unit faced the additional danger that they would be summarily executed if ever captured by the Germans. In July 1944, following Operation Bulbasket, 34 captured SAS commandos were summarily executed by the Germans. In October 1944, in the aftermath of Operation Loyton 31 captured SAS commandos were summarily executed by the Germans. At the end of the war the British Government saw no further need for the force and disbanded it on 8 October 1945. The following year it was decided there was a need for a long-term deep-penetration commando unit, and a new SAS regiment was to be raised as part of the Territorial Army. Ultimately, the Artists Rifles, raised in 1860 and headquartered at Dukes Road, Euston, took on the SAS mantle as 21st SAS Regiment (V) on 1 January 1947. In 1950, a 21 SAS squadron was raised to fight in the Korean War. After three months of training in England, it was informed that the squadron would no longer be required in Korea and so it instead volunteered to fight in the Malayan Emergency. Upon arrival in Malaya, it came under the command of Mike Calvert who was forming a new unit called the Malayan Scouts (SAS). Calvert had already formed one squadron from 100 volunteers in the Far East, which became A Squadron—the 21 SAS squadron then became B Squadron; and after a recruitment visit to Rhodesia by Calvert, C Squadron was formed from 1,000 Rhodesian volunteers. The Rhodesians returned home after three years service and were replaced by a New Zealand squadron. By this time, the need for a regular army SAS regiment had been recognised; 22 SAS Regiment was formally added to the army list in 1952 and has been based at Hereford since 1960. In 1959 the third regiment, 23 SAS Regiment, was formed by renaming the Reserve Reconnaissance Unit, which had succeeded MI9 and whose members were experts in escape and evasion. Since serving in Malaya, men from the regular army 22 SAS Regiment have taken part in covert reconnaissance and surveillance by patrols and some larger scale raiding missions in Borneo. An operation against communist guerillas included the Battle of Mirbat in the Oman. They have also taken part in operations in the Aden Emergency, Northern Ireland, and Gambia. Their Special projects team assisted the West German counter-terrorism group GSG 9 at Mogadishu. The SAS counter terrorist wing famously took part in a hostage rescue operation during the Iranian Embassy Siege in London. During the Falklands War B squadron were prepared for Operation Mikado before it was subsequently cancelled whilst D and G squadrons were deployed and participated in the raid on Pebble Island. Operation Flavius was a controversial operation in Gibraltar against the Provisional Irish Republican Army (PIRA). 22 SAS also directed NATO aircraft onto Serb positions and hunted war criminals in Bosnia. They were also involved in the Kosovo War helping KLA guerillas behind Serbian lines. According to Albanian sources one SAS sergeant was killed by Serbian special forces. The Gulf War, in which A, B and D squadrons deployed, was the largest SAS mobilisation since the Second World War, also notable for the failure of the Bravo Two Zero mission. In Sierra Leone it took part in Operation Barras, a hostage rescue operation, to extract members of the Royal Irish Regiment. In the Iraq War, it formed part of Task Force Black and Task Force Knight, with A Squadron 22 SAS being singled out for exceptional service by General Stanley McChrystal, the American commander of NATO forces: during a six-month tour it carried out 175 combat missions. In 2006, members of the SAS were involved in the operation to free peace activists Norman Kember, James Loney and Harmeet Singh Sooden. The three men had been held hostage in Iraq for 118 days during the Christian Peacemaker hostage crisis. Operations against the Taliban in Afghanistan involved soldiers from 21 and 23 SAS Regiments. A significant force of the Special Air Service was deployed to Northern Iraq in late August 2014, and according to former MI6 chief Richard Barrett will be sent to Syria, tasked with trying to track down the Islamic State terrorist group that the press labeled the Beatles using a range of high-tech equipment and with potentially freeing their hostages. In October 2014, the SAS began executing raids against ISIS supply lines in western Iraq, using helicopters to drop light vehicles manned by sniper squads. It has been claimed that the SAS have killed up to eight ISIS fighters per day since the raids began. In recent years SAS officers have risen to the highest ranks in the British Army. General Peter de la Billière was the Commander-in-Chief of the British forces in the 1990 Gulf War. General Michael Rose became commander of the United Nations Protection Force in Bosnia in 1994. In 1997 General Charles Guthrie became Chief of the Defence Staff the head of the British Armed Forces. Lieutenant-General Cedric Delves was appointed Commander of the Field Army and Deputy Commander in Chief NATO Regional Headquarters Allied Forces North in 2002–2003. Following the post-war reconstitution of the Special Air Service, other countries in the Commonwealth recognised their need for similar units. The Canadian Special Air Service Company was formed in 1947, being disbanded in 1949. The New Zealand Special Air Service squadron was formed in 1954 to serve with the British SAS in Malaya. Australia formed the 1st SAS Company in July 1957, which became a full regiment of the Australian Special Air Service Regiment (SASR) in August 1964. On its return from Malaya, the C (Rhodesian) Squadron formed the basis for creation of the Rhodesian Special Air Service in 1961. It retained the name “C Squadron (Rhodesian) Special Air Service” within the Rhodesian Security Forces until 1978, when it became 1 (Rhodesian) Special Air Service Regiment. Non-Commonwealth countries have also formed units based on the SAS. The Belgian Army’s Special Forces Group, which wears the same capbadge as the British SAS, traces its ancestry partly from the 5th Special Air Service of the Second World War. The French 1st Marine Infantry Parachute Regiment (1er RPIMa) can trace its origins to the Second World War 3rd and 4th SAS, adopting its “who dares wins” motto. The American unit, Delta Force, was formed by Colonel Charles Alvin Beckwith, who served with 22 SAS as an exchange officer, and recognised the need for a similar type of unit in the United States Army. The Israeli Sayeret Matkal has also been modelled after the SAS, sharing its motto. Ireland‘s Army Ranger Wing (ARW) has also modelled its training on that of the SAS, as well as Delta Force (who in turn have been influenced by the SAS). The Irish ARW train with the SAS. The Philippine National Police‘s Special Action Force, heavily engaged in counter-insurgency in the Mindinao region, was formed along the lines of the SAS.